Spring has sprung and it is time to re-discover the many pleasures that Strathcona Park offers us. As we walk along the Rideau River, play Frisbee, picnic with friends, or just laze in the sun on a park bench, let us cast our mind back to the park’s surprising history. The land that is now the park started as a swampy pasturage for the cows belonging to Sandy Hill residents. 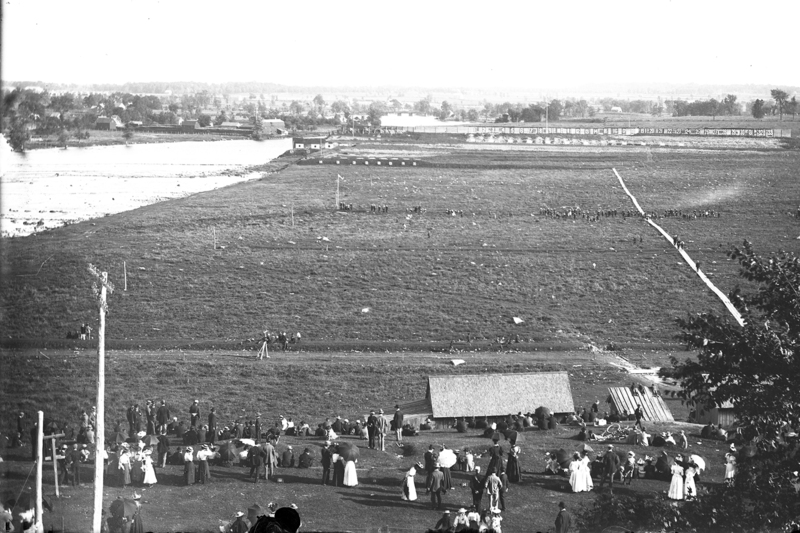 In 1873, it became the Dominion Rifle Range and troops trained here until 1898. The name given to Range Road, the street along the west side of the park, commemorates that use. In 1891, enterprising local residents founded the Ottawa Golf Club, one of the oldest golf clubs outside Great Britain, and created a nine-hole golf course here which hosted the first Canadian amateur golf championship in 1895. The following year, however, rising property values forced the Club to move to the Québec side of the Ottawa River where it remains to this day. 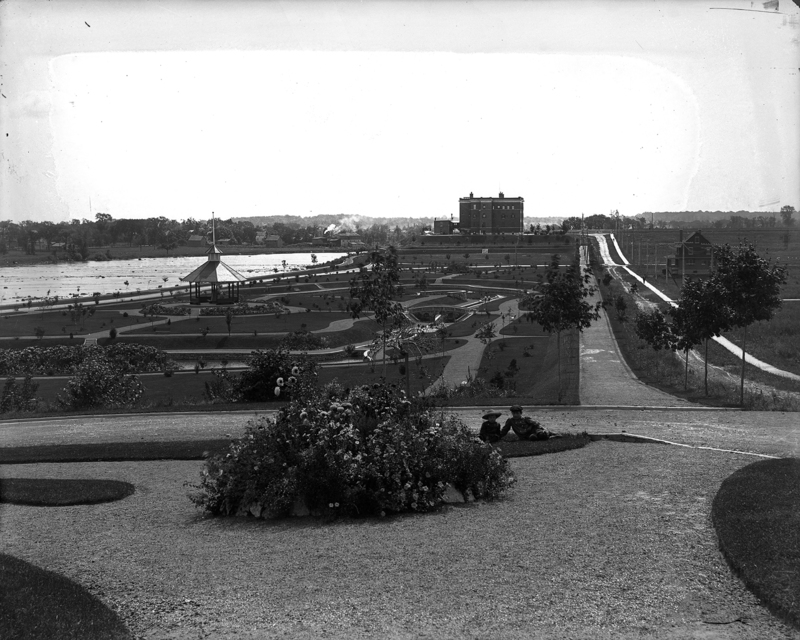 The Ottawa Improvement Commission (precursor to the National Capital Commission) acquired the land in 1904, drained and landscaped it, building waterways and two ponds. 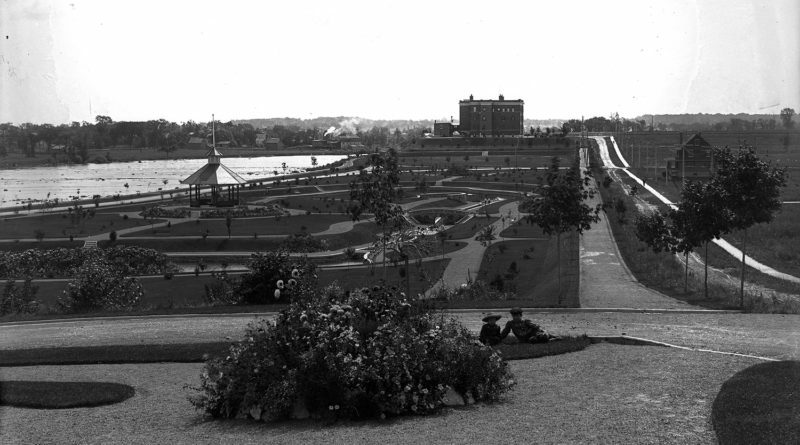 A landscape architect at the time criticized this design as “meaningless, unsatisfactory in layout and vulgar in detail.” Expensive to maintain, the watercourses and ponds were removed in the 1940s and the crumbling gazebo in 1961. That was also the year the NCC closed the park to vehicular traffic. A seasonal wooden footbridge that used to link the park to the Rideau Tennis Club had disappeared shortly before. It has now been replaced by a permanent foot and cycling bridge (the Adàwe Crossing). Starting in 1902, an isolation hospital for patients with contagious diseases existed at the south end of the park where the Sandringham apartment building now stands (see photo above). In 1909, Lord Strathcona donated the fountain standing near Laurier Avenue while he was Canadian High Commissioner in London. The fountain was designed by French sculptor Mathurin Moreau and manufactured in France. A twin of it stands in downtown Buenos Aires. The four standing figures represent the four continents (Europe, Asia, Africa, America), a popular artistic allegory until the 19th century. This spring, the fountain will be undergoing a restoration program this spring. The stone base is badly deteriorated and requires repairs. Work will begin shortly. Strathcona Park was one of the first parks in the city to allow children to play on the grass; it was also a place where one could find fossils along the riverbank. In 1985, it hosted Ottawa’s first Pride Picnic. Today, Strathcona Park is home to majestic trees, a summer theatre, an arts and crafts fair, a wading pool and an award-winning play structure that echoes Mackenzie King’s ruin garden at Kingsmere. The community is also trying to replace the gazebo. So next time you head down to Strathcona Park, remember its colourful history and enjoy it all the more.